Opening 3rd May 2019 at 4:00 to 7:00 p.m. 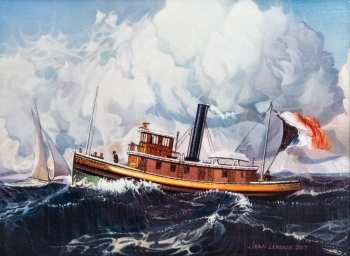 The Naval Marine Archive ­ The Canadian Collection and the Canadian Society of Marine Artists are proud to present the 36th Annual Exhibition of the Canadian Society of Marine Artists. This exhibition will be held at The Victory gallery, 205 Main Street, Picton, Ontario. The Verissage is Friday, the 3rd of May 2019 from 4-7pm. New and exciting art marine art will be shown. The theme is Traditions and the Sea and artwork in various mediums including scrimshaw will be on display by many of our well known signatory members, including John M. Horton, Ray Warren, Peter Rindlisbacher, Alan Nakano, Lloyd Pretty, Stefan Starenkyj, Jean Leroux, Pim Sekeris, George Wilkinson and guest artist Dan Varnals. This Special Vernissage allows you to to meet special guests and be amongst the first to see and acquire these new works before the Exhibition is open to the general public. A fund raising auction will be held to support our charitble activities, so that the goals of our organization continue to be met. Tickets for this opening event are on sale at $25 per person or $40 per couple which include beverages, wine and hors-d'oeuvres. There are a limited number of tickets, on sale now for the opening, some may still be available at the door on opening day. Please plan early and join the fun. The exhibition continues from the 4th of May onward until the end of July and there are no admission fees.